The Riderless Horse is a traditional ceremony that dates back to the days when armies relied on four-legged power rather than motorized transportation. Our ceremony honors the memory of men and women of rodeo. There is a special bond between horse and rider. This relationship cannot be duplicated with mechanical equipment. Over the years, the horse and rider, learning each other's movements, body language, moods and clues, strengthen this bond. When that bond is broken, the horse must adjust to life without its familiar partner. The Riderless Horse ceremony is intended to honor all of those loved ones who are no longer with us. Reversed boots placed in the stirrups show that the rider has passed away. 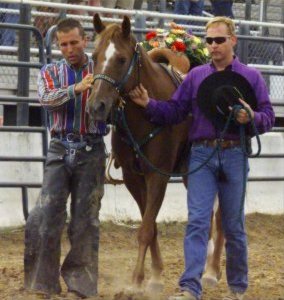 Our Riderless Horse ceremony is an honor usually reserved for someone who has worked for our community, in the fight against AIDS, or for the rodeo itself. They represent the fact that life goes on with new people taking up the fight for their fallen comrades. If you watched the funeral proceedings for the late President Ronald Reagan you may have seen the horse Sergeant York, as he walked behind the President's caisson. Born in 1991, this Standerbred was registered as Allabord Jules, and he pulled a sulky at New York and New Jersey tracks until 1996. The horse's trainer became aware that the US Army was looking for solid black horses and knew Sergent York was perfect for the Army. By 1998 Sergeant York had moved up the ranks to this distinguished position. He has performed expertly in more than 1,000 funeral services honoring fallen soldiers and high-ranking government officials. Another famous example of this ceremony was John F. Kennedy's funeral procession. The horse, Black Jack, was walked riderless behind the casket that carried the President's body.